Miniature Chisels Tool Kit - HSS For the wood turners that like to work in miniature. 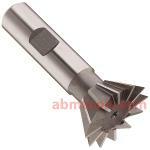 Single Angle Shank Type Cutter - Inverted Dovetail Cutter Dovetails are typically either 45 degree or 60 degree. Mitre Box These slots provide the guide for the saw to follow. T-Rex Portal CNC Milling Machine The T-Rex milling machine allows efficient processing in 2D/3D. See the products from F.LLI ALBERTO & C. S.N.C.